The All Progressives Congress (APC) has said Nigerians must hold President Goodluck Jonathan personally responsible if the Ebola Virus Disease spreads more than it has done in the country, after he failed to stop a rally in his support in Port Harcourt on Saturday, despite warning from individuals and groups. In a statement issued on Sunday in Lagos by its National Publicity Secretary, Alhaji Lai Mohammed, the party said never before has a President of a country sabotaged his own Administration’s policy and endangered the lives of his compatriots as President Jonathan has done over the issue of Ebola. It said the same President who declared a national emergency on Ebola and advised against large gatherings to prevent the spread of the virus was the first to flout his own advice by his failure to stop the rally by the so-called Transformation Ambassadors of Nigeria (TAN) in Port Harcourt, a few days after the virus was detected in the city and at a tiEme that contact tracing was going on to find all those who may have had contact with the medical doctor victim of the disease. Nigerian. This President simply says what he doesn’t mean. ”As we said in our statement of Aug. 28th 2014 calling on President Jonathan to halt the TAN rallies, especially the one in Port Harcourt, could anyone guarantee that none of those who have had contact with the medical doctor who died of the disease will attend the rally? 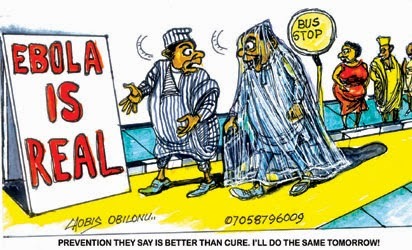 That is why we are calling on Nigerians to hold the President responsible if Ebola spreads more than it has in the country,” APC said. The party said shortly after it made the call for a halt to the TAN rallies, others, including the NBA and Prof. Itse Sagay, in a clearly patriotic duty, issued similar calls. APC said for those who might try to spin the issue by saying the President has no control over the organizers of the rally, they should be asked who the rallies will benefit, whose top officials, including Secretary to the Government Anyim Pius Anyim, have been attending the rallies and what is the source of the funding of the gatherings. ”The TAN rallies are government-sanctioned. The TAN rallies are the Jonathan Administration’s cunning way of beating the INEC ban on campaigns for next year’s general elections. The TAN rallies highlight the impunity of the Jonathan Administration. President Jonathan is the sole beneficiary. He can stop the rallies today, if only he wants to put the nation’s interest above his own personal interest,” the party said.